In high school and during my undergrad years, I ate, drank, slept, and breathed theatre. It was not at all uncommon for me to read a new and different play every day and I lost track of how many plays I was in or performances I attended. I loved it. But life happens and theatre is not really much a part of my life anymore. I miss it. And I'm occasionally a bit jealous of those of my theatre friends and compatriots who have found ways to keep at least one foot in the theatre world where I have not. 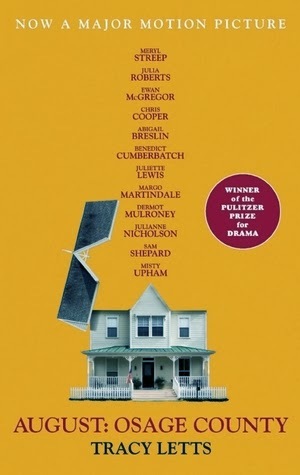 So in some ways, picking up August: Osage County, the first play I've read in years, was like coming home. It also reminded me how very rusty my theatrical reading skills are. I was drawn to this play by the quality of actors starring in the film of the same name, closely based on the original play. Anything with Meryl Streep catches my attention, and when you throw Julia Roberts, Ewan McGregor, Juliette Lewis, Sam Shepard, and Benedict Cumberbatch in the mix it's hard to resist. Any work that can attract that caliber of acting talent really must be something else. Reading a play is very different from reading a novel. So much is explained in the prose surrounding the dialogue in a novel, whereas with plays there's a bit of stage direction, but very little else to direct your reading of the dialogue. And when all you have is the dialogue, so many readings are possible! Now, I'm a bit of a literalist when I read, so it takes some work to get the between-the-lines stuff and August: Osage County is full of that. It's also described as a skillful mix of black comedy and epic tragedy, but being a literalist makes it easier to see the "tragic" and makes the "comic" more difficult to find. That doesn' t mean it's not there, but I had to work a bit to find some of it, rereading portions and taking the time to try out a few different readings in my head. But I think that's as it should be. If you read a play and only come away with one possible reading, I think you've missed a wealth of human possibility and cheated yourself out of a richer understanding of not only the play, but human nature in general. I think I need to start reading plays again. Note: There is quite a bit of language in this one, so keep that in mind if you plan on picking it up.